Aluminium materials are characterised by good deformation properties. These enable different bending possibilities. In most cases, roll bending is the most flexible and cost-effective bending method. The section is guided between three adjustable rollers and successively bent to the desired radius. Roll bending is the ideal bending process for sections with complex shapes and different radii. In the past, FKM already offered bending as an extended service in addition to CNC processing. FKM has now invested in a new ARKUS 12 bending machine. Aluminium sections with the smallest radii (> R35 mm) can be bent with this modern 3-roll bending machine. On the X-axis (of the bending radius) we achieve a pressure load of 12 t with a positioning accuracy of 0.01 mm. The optical length stopper and the PC-400 control, visual control and software support guarantee the highest precision. 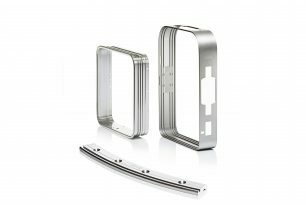 Whether frames for suitcase systems, vehicle components or decorative trims for ocean-going yachts or parts of cabin interiors of cruise liners, FKM offers a wide range of options for forming aluminium sections into the fitting shape.